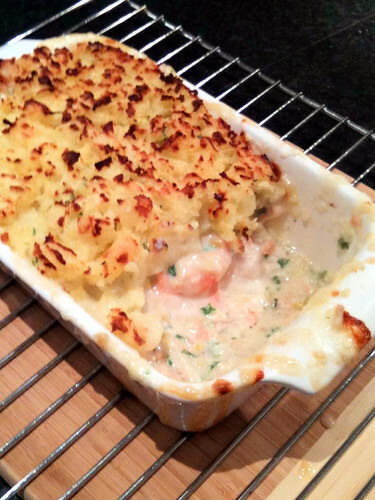 I made fish pie for the first time recently and it was so delicious. I was inspired by a recipe I'd seen on a Hugh Fearnley-Whittingstall show. The one in the link is similar to the one I'd seen, but not the same, so I just approximated something in between the two with what I had available. I used a salmon fillet (an oily fish), 2 fillets of pangasius (a white fish), 12 large pre-cooked prawns in shells, and some smokey bacon (rather than smoked fish). We had some leftover mashed potatoes with chives mixed in, but you could also make mashed potatoes specifically for this. Fry some thinly sliced leek, a chopped shallot, and some chunks of bacon (not slices, buy a piece of bacon and cut nice lardons) in a frying pan and set aside. I actually partially fried the bacon first, drained some of the fat, then added the leek and shallot. Peel the prawns and put the shells in a pot with some fennel tops, leek trimmings, and half a large carrot chopped into chunks. Add 750 ml of milk and bring to a simmer. Place your fish fillets on top, cover, and turn down to minimum or even turn off. This should partially steam/poach your fish and flavour the milk. After your milky stock seems ready, 10 minutes maybe, take your fish out and pour the milk into a jug through a sieve. Then make a white sauce (you'll need about 3-4 Tbsp each of butter and flour for the roux to thicken it). Stir in some fresh ground pepper and chopped fresh parsley, chives, and basil to the finished white sauce. Cut your fish fillets into bite-size chunks and mix them into the white sauce, along with the prawns, bacon, leeks, and shallots. Since there's bacon in it, you won't need to add any salt. Pour this gooey mess into a baking dish and top with the mashed potatoes. Bake for about 25 mins at 200° C. Leave some room for the sauce part to bubble up. I over-filled my dish and it bubbled over into the bottom of the oven making a really spectacular mess. I didn't have a 9x9 inch pan, so I used a loaf pan and set aside the extra fish mixture. (We finished cooking it in the pot and saved it to have on pasta the next day). This is a bit of fiddly dish to make since there are several separate steps, but it's quite easy to do, and it's a yummy thing to make for someone special. Sounds really yummy! I'm going to try the recipe next week. Thanks!